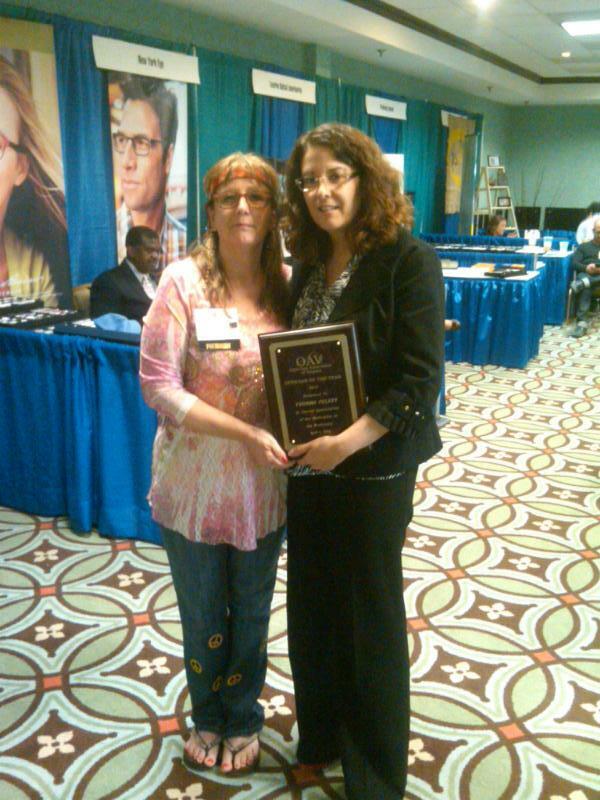 Yvonne Metten, director of the Opticianry program at J. Sargeant Reynolds Community College, was recently named Optican of the Year 2012-2013 by the Opticians Association of Virginia. The award is given to an optician who demonstrates exemplary service and dedication, gone above and beyond the call of duty every day, shown outstanding leadership, and is deserving of recognition. Yvonne has an AAS degree in Opticianry from J. Sargeant Reynolds Community College and a Bachelor of Liberal Arts degree from the University of Richmond. She is a Virginia state licensed optician with over 20 years of experience in both private and retail optical settings. She has lectured at state and national meetings and has written an article for a national trade publication. In discussing selection for the award it was noted, “Yvonne has done a tremendous job incorporating the need for and value of community service programs into the educational process while overseeing the opticianry program for the past two years at JSRCC. Under her guidance the program has been able to turn out over 1,000 pairs of eyewear that have been manufactured for OneSight missions, and took the students on a mission trip to Jamaica where they spent 10 days serving the under-privileged citizens in the region. Yvonne also created a clinic program last summer for Middle College students (young adults 18-24 who are attempting to earn their GED so they can attend college) who were found to have a need for vision correction that they could not afford. The program allowed these students to get free eye exams and eyewear. As we all know, our ability to see is a critical part of learning! The mission of the Opticians Association of Virginia is to advance the skillful practice of Opticianry for the safety and welfare of the people of Virginia, by representing, educating and serving all Opticians. To read more about the OneSight mission trip, visit "Seeing is believing as Reynolds opticianry students change lives in Jamaica." Today Senator Warner spoke from his office via Skype with students of Richmond’s J. Sargeant Reynolds Community College. Senator Warner began by speaking about the debt and deficit, and how Congress’ dysfunction has made a challenging problem far worse. He also spoke about bipartisan legislation that he has recently co-sponsored, the Student Right to know Before You Go Act, which aims to provide students with comprehensive information about the cost, duration of study, and related job availability of college degrees they plan to pursue. Senator Warner also took questions from the students, whose areas of academic focus ranged from public policy, to law, to criminal justice and more. One student, who was pursuing a degree in education with the goal of becoming a teacher, asked Senator Warner what he was doing to prevent deficit reduction from leading to further cuts to our education system. 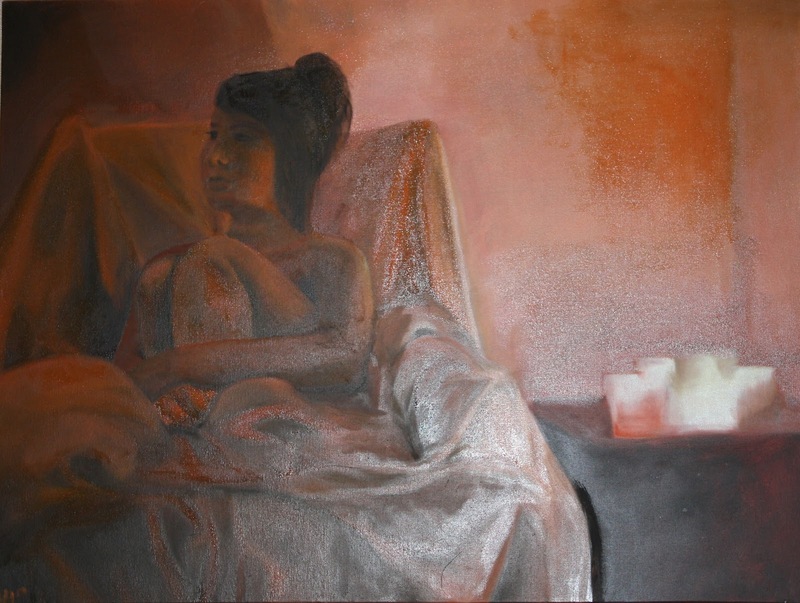 On Wednesday evening, April 17, a large group of art enthusiasts gathered in the Gallery of Georgiadis Hall on the Parham Road Campus to celebrate the artistic accomplishments of JSRCC students as the winners of the 2013 Student Art Show were announced. Each spring the walls of the Gallery become an art gallery for the Student Art Show, displaying creative works in all shapes and sizes. This year 73 individual works of art were on display from April 2nd through April 17th. The artwork included paintings, drawings, and photographs. Many of the works offered for sale were purchased by the audience members during the reception which followed the announcement of the award winners. Several were purchased by JSRCC Educational Foundation and will soon grace the halls of buildings on the Parham Road Campus. Last Thursday, April 11, more than 70 people gathered in the Gallery to try out some dance steps from around the world. JSRCC Chemistry professor Sevag Sinanian started the program by introducing dances that are common to his country of heritage, Armenia. Born in the U.S., Sev was raised in a traditional Armenian household so his ethnic roots run deep. The folk dances he invited attendees to try out included popular traditional Kef-time dances. Typical musical instruments include the “oud” (Middle Eastern lute), “kanun” (zither), “dumbeg” (goblet drum) and clarinet. Spanish professor Maria Espiritu followed Sev. Dressed in colorful Peruvian dress, she led eager attendees in the Wayno. This Peruvian dance from the Andes is performed during festivals, holidays and special occasions. It is usually danced in groups in the country or in open spaces, but we had plenty of room in the Gallery to try it out! The program concluded with a group of Filipino dancers – staff members Jinky Davis and Maria Clarke, along with students Nino Ballesteros, Shiela Kenney and Myrisa Nadal. The dance they performed is associated with the Sinulog Festival, which is held every second week of January. This dance was derived from imitating the current of the river. View the video: Dancing with the Int'l Stars! When fatal vision goggles are worn, they allow an individual the opportunity to experience the dangers of impairment from drugs and alcohol without suffering the real consequences. They have a first-hand account of impairment of driving skills, coordination, and personal judgment. Sponsored by the Multicultural Enrichment Council, JSRCC's "Around the World through Movies" recently presented The World’s Fastest Indian. Attendees included JSRCC students, staff, faculty and guests from the Richmond community. The World's Fastest Indian is a 2005 New Zealand biographical film based on the Invercargill, New Zealand speed bike racer Burt Munro and his highly modified Indian Scout motorcycle. Munro set numerous land speed records for motorcycles at the Bonneville Salt Flats in Utah in the late 1950s and into the 1960s. The film stars Anthony Hopkins and was written and directed by Roger Donaldson. The film opened in December 2005 to positive reviews, and quickly became the highest grossing local film at the New Zealand box-office. Dr. Bryan Rhodes, Assistant Professor of Biology led pre and post movie discussions that highlighted New Zealand’s history, and geographical structure. He also shed more light on the fascinating story of Burt Munro, the lead character in the movie. Ms. Betsy Edwards, Admissions Specialist from School of Nursing and Allied Health, shared a beautiful poem she had written called “The Indian Dream” which was in line with the inspiring story of the movie. The audience enjoyed variety of refreshments during the show. The movie was followed by a post discussion and trivia questions where many students and staff won prizes including many items donated by JSRCC Book Stores and Office of Marketing. With the arrival of the first day of spring on March 20th, our thoughts turn to all things green, especially gardening. As you begin to plan your garden and think about homegrown, fresh vegetables consider a new place to get the seeds you need. Instead of going to a big box garden center and buying seeds from who knows where, why not “check-out” seeds from the new seed library on the Goochland Campus? 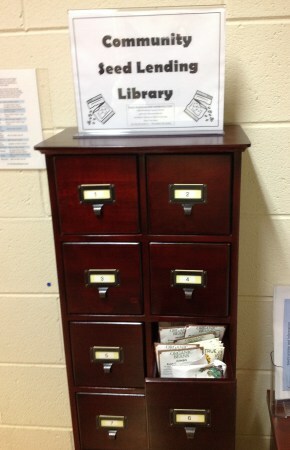 The seed library is replenished when those individuals who borrowed seeds return them at the end of the growing season. The hope is that those contributions will not just include seeds to replace those that they were withdrawn, but seeds for other varieties of plants thereby expanding the inventory of available seeds for the next growing season. So far, workshops were held on March 5th and March 19th. Additional workshops are scheduled for April 1st and April 15th at 6:00 p.m. For more information, please contact Betsy Trice at btrice@reynolds.edu. Each year March is designated as Women’s History Month, a celebration of women’s contributions to history, culture and society. For today’s young women it is hard to imagine a time when women could not vote, but it was just 100 years ago this month, on March 3, 1913, that 5,000 suffragists marched up Pennsylvania Avenue in Washington, D.C. demanding the right to vote! Although Women’s History Month had its origins as a national celebration in 1981 when Congress requested the President proclaim the week beginning March 7, 1982 as “Women’s History Week", it wasn’t until 1987 that Congress passed Public Law 100-9 which designated the month of March 1987 as “Women’s History Month." In honor of Women’s History Month 2013, JSRCC’s Multicultural Enrichment Council sponsored A Celebration of Women’s History Month on Friday, March 22, 2013 at the Workforce Development Conference Center. The program, entitled Empowerment: Connecting the Past, Present and Future, featured several successful women from the greater Richmond community who shared their paths to success. Reba Hollingsworth, anchor and reporter from WTVR, CBS-6 served as moderator for the event. Lacette Cross, Coach/Mentor at Camp Diva, decided to follow her heart and work in youth development at age 30. “I was sitting in my car and listening to the radio. The news report was on the latest STD stats. I realized there's so much work to be done around sexual health and disease prevention, and pregnancy prevention especially among young African-American women. Girls everywhere need to have a safe place to talk with someone about sexual health. What it means to empower them to make better decisions and be a good steward of sexuality.” Her advice to the audience, “Always know your passion, stay connected with it, be willing to do it for free and the money will follow." Alexsis Rodgers is a graduating senior at Virginia Commonwealth University pursuing bachelor’s degrees in mass communications and Spanish and a minor in political science. Last fall, she worked full-time in Henrico for President Obama’s re-election campaign, particularly energizing high school students and involving them in voter education and empowerment activities. With a pronounced interest in minorities’ interactions with politics, she has researched the issues of low voter turnout, access to interpretation services in Virginia courts and now the desegregation of school systems. In February Alexsis was recognized by faculty members in VCU’s School of Mass Communications, receiving the 2013 Black History in the Making Award for achievements in academics, career or service. She plans to continue gaining experience in the communications industry after she graduates, perhaps at CRT/tanaka where she currently is an account coordinator. Eventually, she aspires to work with a nonprofit, strengthening humanitarian efforts in underdeveloped communities. VCU student Anna Scherbakova bridged the language gap for her parents which made her very independent at a young age. She decided to pursue her passion of design with the goal of finding personal fulfillment. She credits her success to the many mentors who have helped her along her path including an English teacher who made her formulate realistic, achievable goals, an advisor who recommended a documentary that solidified her decision to apply to arts school and Alexsis Rodgers who encouraged Anna to apply to be a Career Center Ambassador and inspired her with her dedication and drive showing her that anything is possible and no dream is too big. It was an inspiring day for all the participants and a reminder of how far women have come since that day 100 years ago when they marched, demanding the right to vote. Despite our best intentions, life doesn’t always turn out the way we plan. Students enter high school anticipating four consecutive years of study culminating with graduation. However during those four years circumstances change, plans go awry, and not every student finishes high school as planned. How do those individuals, some with dreams of not only completing high school but going on to college, pick up the pieces, get back on track to earn a GED, become job ready and/or go on to college? Ten years ago, in 2003, the Virginia Community College System (VCCS) began a new initiative known as Middle College which was designed to offer a college opportunity to individuals between 18 and 24 not currently enrolled in high school, who demonstrate a 9th grade level based on Reading and Math test results, and who are ready to commit to their future through participation in a structured academic and pre-vocational program. Reynolds was among a handful of VCCS schools who immediately adopted the program. 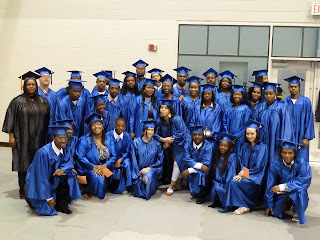 While preparing for the GED, students also receive assistance with enrolling in college, applying for financial aid and scholarship opportunities, identifying an academic/vocational plan, preparing for the Virginia College Placement test (VPT) and registering for classes, all at no cost to the student. In the last ten years more than 809 students have been served by the Middle College at Reynolds. Of those 809 students, 565 or 70% have earned their GED, and 548 (68%) have also earned a Career Readiness Certificate (CRC), a workplace credential. The majority of students also completed a Student Development Course, earning their first college credit. Over 300 of the Middle College graduates have continued with college at a VCCS institution. There are currently 50 program graduates enrolled at JSRCC while others chose to pursue training at other educational institutions in the Richmond region. Some graduates have decided to pursue employment to gain stability before pursuing additional training while others work while also going to school on a part time basis. After graduating from the Middle College Sherika worked for years at a local cable company and took classes at JSRCC in the evening. She has completed 57 college credits but has taken a break from classes to pursue her lifelong dream of opening a daycare center which she now operates out of her home. Jamal and Jessica decided continue their education immediately after completing the Middle College and they are both now taking classes at the college. Jessica has already completed a certificate program and is now working towards her Associate’s degree, Jamal is on the Dean’s list. Ronnie finished the Middle College and was selected for an exposure event at NASA’s Langley Research Center in Hampton, he is interested in pursuing a degree in Science or Technology. Crystal graduated from the Middle College in 2007 and returned to earn her Pharmacy Tech certificate in 2012, she is now working at a local hospital with aspirations to become a pharmacist. Natasha is pursuing her degree in Architecture and working at a local architectural firm. Middle College graduates are now students in 4 year colleges and universities, managing local establishments, and working in public and private offices all around the region. Several students are also now employed by J. Sargeant Reynolds Community College. This year the Middle College received more than 500 applications. A rigorous process of testing, interviewing, and orientation results in a maximum of forty students being accepted in both the fall and spring semesters, and an additional 20 students are typically accepted in the summer. JSR alum Jackie Epps who serves as the Middle College’s office specialist has been with the program since its inception, providing an incredible wealth of institutional knowledge. Three work-study students who are Middle College graduates serve as mentors to current students in the program.